This product is now obsolete and has been replaced by the D-70. 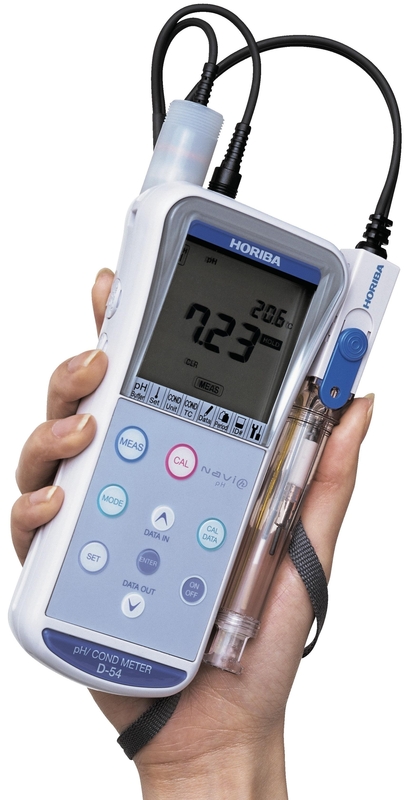 Portable multi-parameter meter allows for dual measurements. Self diagnostic function assures reliable measurement. User-friendly features and portability with large LCD display. D-51 - Economical meter for pH and temperature. D-52 - Multi-parameter meter for ph/temperature/ORP with PC/printer output capability. D-53 - Multi-parameter meter for pH/temperature/ORP/ISE with PC/printer output capability. D-54 - Multi-parameter meter for pH/temperature/ORP/conductivity with PC/printer output capability. D-55 - Multi-parameter meter for pH/temperature/ORP/dissolved oxygen with PC/printer output capability.